Range of motion exercises are important during stroke recovery. So today we’re sharing 8 range of motion exercises for stroke patients. Hopefully you can work some of them into your daily stretching routine. But first, it’s important to understand the difference between range of motion exercise and passive exercise. Passive exercise refers to a movement where you exert no effort in the targeted muscles. Passive exercise can be performed on your own or with the help of a caregiver. For example, to passively exercise your affected arm, you can use your ‘good’ arm to move it, or you can use the help of a caregiver to move it. 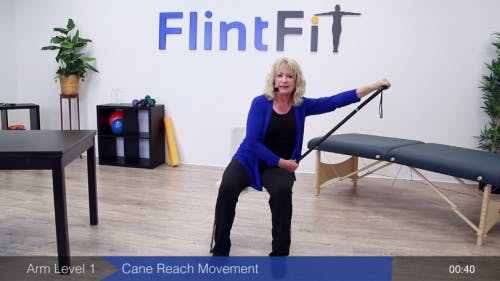 Range-of-motion exercise, on the other hand, refers to any movements that take your joints through their full range of flexion and extension. Range-of-motion exercises can be performed passively or actively (where ‘actively’ simply means you perform the movement yourself). There are many benefits to moving your muscles. For one, it helps reduce spasticity and muscle stiffness. It also helps increase muscle flexibility and prevent painful contractures. Movement also helps prevent learned nonuse, a phenomenon where your brain completely forgets how to use your affected muscles. Learned nonuse can easily be prevented by moving your affected muscles a little every day. Even if you can’t move your muscles yourself, passive exercise still helps send signals to your brain and keep that connection alive. The following range of motion exercises are suitable for stroke survivors with movement or with paralysis on one side of their body. Each stroke exercise features a picture of Barbara, our favorite OT. If you have movement in your affected side, then these exercises will be a great way to improve flexibility in your muscles. 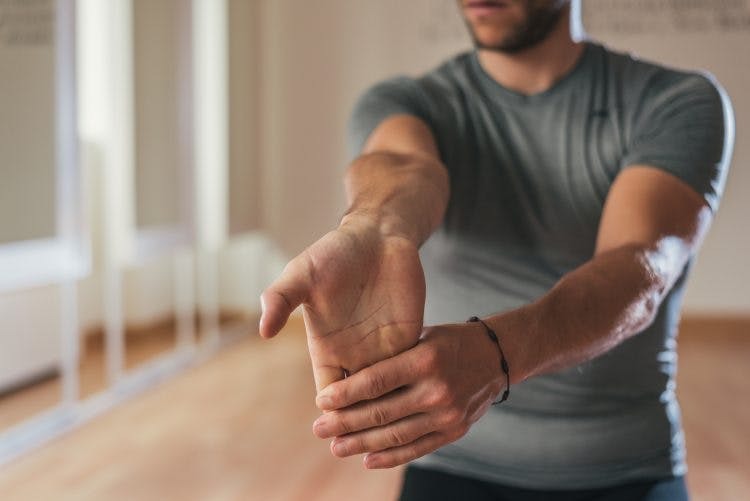 If you have no movement in your affected side, then these exercises will help prevent learned nonuse and reconnect your mind to your muscles. They will also help improve flexibility in those muscles. From a seated position, place your hands in your lap. Then, interlace your fingers, and stretch your affected arm palm-side up. You should feel this stretch all the way up your inner arm. Hold this stretch for 20 seconds and release. Then, repeat on the other side. With your fingers still interlaced, gently bend your affected wrist backward and get a nice stretch there. Hold this stretch for 20 seconds and release. Repeat on the other side. And remember: never stretch to the point of pain. You will need: a cane and a chair. Sit in a chair and place your affected hand on a cane, then place your other hand on top. 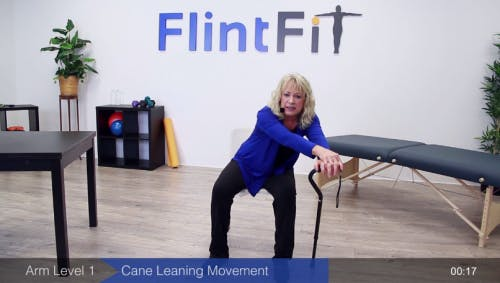 With the cane on your affected side, lean into the cane and put some of your body weight into your affected side. Hold for 5 seconds and return to center. Repeat 5 times. From the same position as the Cane Stretch, begin to make large circles with your body, using the cane for balance. Lastly, use the cane for support as you lean out toward your affected side. Move slowly and safely to get a good stretch. 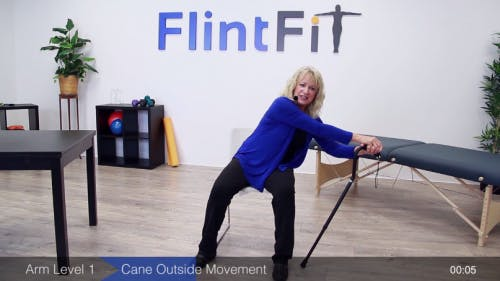 Grasp both ends of a cane and then push your affected arm up towards the ceiling on your affected side. Feel that stretch as you slowly push your affected arm up into an extended position. Hold for a few seconds and slowly return to center. Repeat 5 times. To increase this stretch, slightly turn your head toward your affected side. This will make your body turn that way too and increase the stretch from this exercise. If you have very stiff arms and can’t reach your arm up very high, just try your best. This stretch will still benefit you. You will need: a table and a water bottle. Clasp your hands and place your arms on the table. Then, place a water bottle in front of you as your target. Then, glide your arms across the table towards the water bottle. Stretch as you lean forward and nudge the bottle further away, Then, return to an upright position. Repeat 5 times and try to stretch a little further each time and nudge the bottle a little more. With your hands still clasped around the water bottle, make big circles around the table. Do a few circles one way, and then do a few the opposite direction. Never Stretch to the Point of Pain! Before we conclude this article, we’d like to remind you to never stretch to the point of pain. Stretching until it’s painful is not helpful and can actually cause serious damage. So always stretch safely! We hope you enjoyed these passive range-of-motion exercises. Now, go put some of them into practice. As one of our blog readers, you can get instant access to our stroke rehab exercise ebook with 13 pages of exercises by signing up below! Each exercise features pictures of a licensed therapist to help guide you.